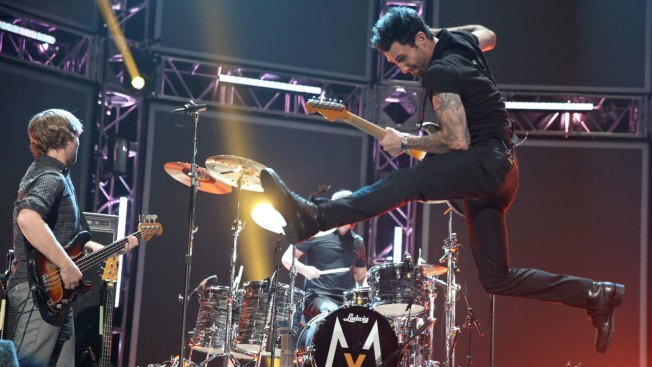 Musicians Mickey Madden, Matt Flynn and Adam Levine of Maroon 5 perform onstage at The GRAMMY Nominations Concert Live! The group is reportedly set to perform at the Super Bowl. Maroon 5 is set to headline the 2019 Super Bowl Halftime Show, E! News has learned. Adam Levine and bandmates James Valentine, Jesse Carmichael, Mickey Madden, Matt Flynn, PJ Morton and Sam Farrar will take the stage on Feb. 3 at Mercedes-Benz Stadium in Atlanta during Super Bowl LIII. Neither the band or nor the NFL has yet to comment publicly on the Super Bowl news. While we wait for the band to dish on their upcoming show, let's take a look at a few of the reasons to be excited about their performance. 1. Possible Guest Appearances: The band has collaborated with a number of incredible artists over the years, most recently Cardi B on the hit song "Girls Like You." Given that audiences love surprise moments, Maroon 5 could bring Cardi on the Super Bowl stage with them during their performance. Maybe they'd even do something with Levine's The Voice co-stars! 2. Cute Family Moments: Here's hoping the camera pans to Levine's wife, supermodel Behati Prinsloo, and their two daughters, Dusty Rose and Gio Grace, watching in the audience! 3. Years of Hits: Maroon 5 has been releasing hit songs for over a decade. The band's first studio album, Songs About Jane, was released in 2002 and featured hits like "She Will Be Loved" and "This Love." Over the years, the band has continued to produce chart-topping songs, which will have the audience on their feet at the Super Bowl. 4. They Know How to Put on a Show: The band has toured the world together for many years, so they know what their fans want from them. They're going to give us all the hits! 5. TV Pros: Levine knows a thing or two about being on TV, since he's been a coach on The Voice for years now. He'll make sure everyone is prepared on game day! The 2019 Super Bowl will air on Feb. 3.